Aplin’s US debut Light Up the Dark has distinct commercial appeal, but may not be her best in the long run. Much has been made of the idea of “the global village”, how world communication has been achieved through technology and the (usually) easy movement of information on the internet. 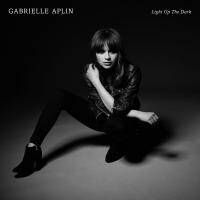 Gabrielle Aplin could be said to have benefited from this, finding early success on YouTube. After a few years of guerrilla videos and three EPs, she signed to Parlophone in 2012, and in 2013 released her debut long-player English Rain. As this was not issued worldwide, Light Up the Dark is billed as Aplin’s debut in the US. Technically perhaps this is the case, but it’s difficult to imagine anyone desperately struggling to get hold of a copy of English Rain considering the quantity of discs and vinyl being sent around the world by post. The idea of “imports” (permitting a retailer to slap a sticker on the front of a CD or record and charge extra) almost seems to have been dropped completely, surely a good thing for the consumer. All of this to say that this album is not really a debut. This is also apparent as soon as the album opens, with the sophisticated pop of “Light up the Dark” – catchy but brooding, as if Aplin has been hanging out with My Morning Jacket. It’s an impressive start, and it continues with “Skeleton”, upbeat and semi-angry; the arrangement has lots going on, making this contemporary now, but possibly not in ten years' time. “Fools Love” has a great smooth hook of a chorus which Aplin glides through seemingly effortlessly. Aplin may be best known in the UK for her haunting cover of the Frankie Goes to Hollywood ballad “The Power of Love” (featured on a UK Christmas commercial in 2012). It was remarkable for its sensitive vocal. There are a number of ballads on this album which could be similarly adopted: “Hurt”, mid-tempo and pensive, is charmingly unspoilt on its own, but seems ready-made for putting over the top of a “thoughtful” moment in an American TV drama. “What Did You Do?” begins sweetly but quickly turns into a rousing communal sing-a-long which seems ideal for commercial television. It would be cynical to assume this is purposeful, and in any event singers/songwriters are entitled to an honest buck if they hit the sweet spot. However there’s a risk from repeating this move too many times with the same artist; when transferred to television, a genuine moment of emotion in the recording studio or when writing the song can look insincere in a different context, as Pavlov’s dog whimpers and drools in the corner. The remaining ballads are perhaps less obvious for exploitation. “A While” is the least commercial, but probably the best as it seems the most natural. The classy but guilt-ridden come-down track “Heavy Heart” is well-executed. “Shallow Love” is sweetly acoustic with Aplin’s voice sensibly at the front. She also slows things down for “Slip Away”, with a slinky rhythm and some dramatic, Florence-like keyboard chords. “Anybody out There” and “Together” also have Florence-like yelping/flourishes/production which although not fatal, end up slightly wearing. There is a connection through Craig Silvey, who mixed the title track; as well as Florence, he has also worked with Arcade Fire, and there are unexpected moments of bang-drumming on this album. In particular “Sweet Nothing” heads into rock as Aplin tackles the big subjects of modern alienation and loneliness; ultimately it’s the sweet tone of Aplin’s voice which makes the track, the complex backing superfluous. If the record company steered the artist towards “breaking America” (although admittedly we can’t guess the intent), Light up the Dark may serve its purpose; it shows off Aplin’s voice and there are some fine moments on the album. It seems unlikely however that this album will be Aplin’s greatest artistic statement. She is undeniably talented, but in the long-run if this turns out to be her best ever record, I will eat my figurative hat.